American swimmer Jack Conger may not be quite as famous as his teammate Ryan Lochte, but he's becoming quite well known, and it's not because he helped win the men's 4x200-meter freestyle relay at the Olympics. On Wednesday, Aug. 17, Conger was detained in Rio because he is one of four U.S. swimmers who were allegedly robbed on their way back to Olympic Village early Sunday morning — that's why Conger is suddenly receiving a lot of attention. Update: Brazilian police officially declared that the four U.S. swimmers were not victims of robbery, BuzzFeed News reported. Instead, the Brazilian officials said that the swimmers "vandalized the restroom" of a gas station and they tried to leave the scene before police officers could arrive to help. Earlier: 21-year-old Conger was removed from his flight back home on Wednesday. According to ABC News, the swimmer was about to head back to the United States when a Brazilian judge ordered that he stay in Brazil and that Conger's passport be seized. 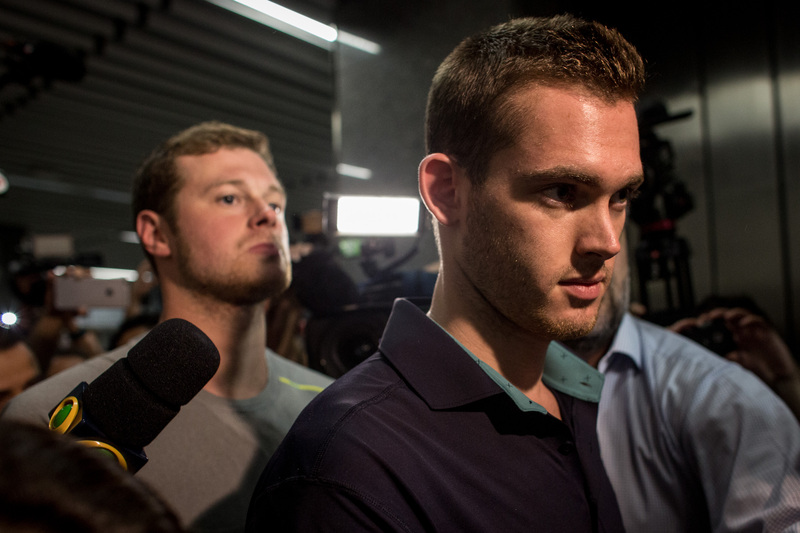 Two of Conger's teammates, who were also victims of the alleged robbery, Jimmy Feigen and Gunnar Bentz, were also detained in Rio, but Lochte had already returned to the United States. Conger and Bentz were questioned at the airport (where they were removed from their flight) for over three hours, according to ABC News, and told they could not leave Brazil until they gave another interview to Brazilian authorities. It is expected that Conger, Bentz, and Feigen will give the interview on Thursday, Aug. 17, but it is unclear when they will return to the United States. Conger, Bentz, Feigen, and Lochte alleged that they were robbed at gunpoint in Rio on Sunday night, but recently, the swimmers' claims have come into question by officials in Brazil. CNN reported that a judge in Rio is questioning the veracity of the testimonies of the swimmers, partially because Lochte and Feigen's accounts of the alleged robbery do not add up. Lochte said that there was only one robber involved in the incident, while Feigen claimed the swimmers were held at gunpoint by multiple robbers. The judge was also reportedly confused by footage of the four teammates after the alleged robbery. In the video the swimmers don't seem perturbed, and still have their valuables with them. Brazilian officials declared that Lochte and his teammates lied about the robbery incident and that they were acting "rowdy" in a local gas station. The New York Times reported that Conger is a student at the University of Texas in Austin, and is from Rockville, Maryland. The Rio games were the 21-year-old swimmer's first Olympics. Conger didn't make too much of a splash for his contributions to the U.S. men's swim team during the Rio Olympics. However, due to questions about the alleged robbery, the swimmer is becoming a well-known member of the Olympic team. Yet, it's doubtful that this is how Conger wanted to be remembered for his Olympic debut.